Not much could top learning to dive as a trip highlight for Tony and me, but if you can believe it, the beautiful island where we first learned to breathe underwater had other delights in store for us of the aquatic variety, namely: turtles and lots of ’em! 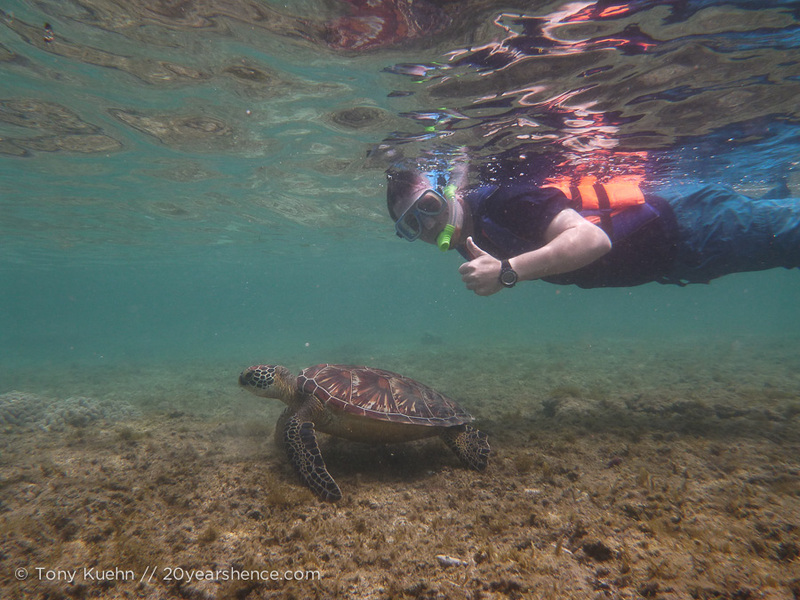 In all the hullabaloo surrounding our diving preparation, we overlooked the fact that not only was our island paradise a marine sanctuary but also home to a turtle sanctuary as well. 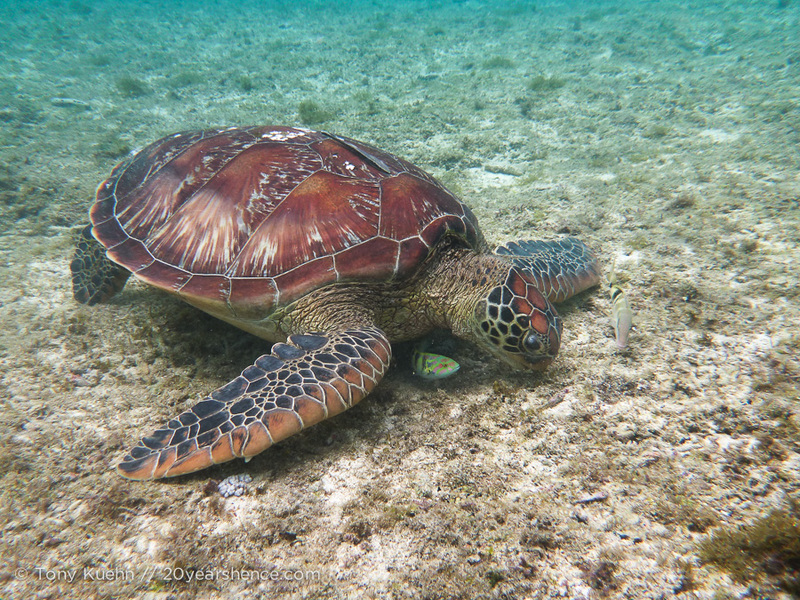 Along the shore, dozens of green turtles are drawn to the shallow water where they graze on the algae that grows there in abundance. Naturally, this environment spoiled us as divers as we routinely spotted at least one turtle on every dive. 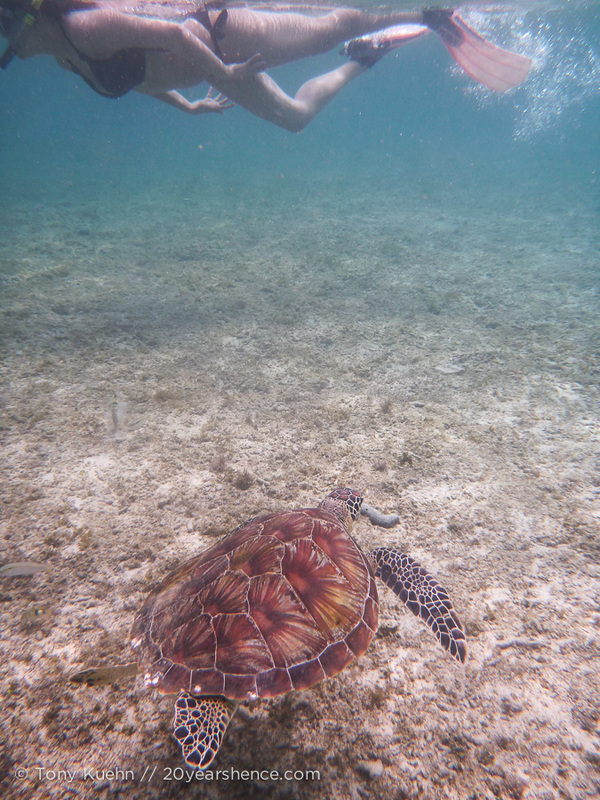 Our best turtle encounter, however happened not during a dive, but during a snorkeling expedition. 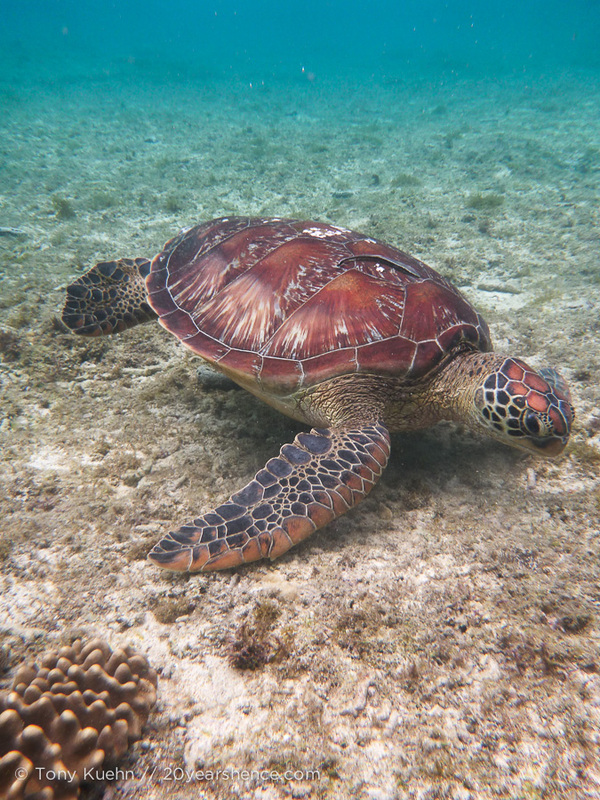 Sunlight promotes algae growth, so the plant is most abundant in shallow water, which makes turtle spotting perfect even for those swimmers not interested in going especially deep. 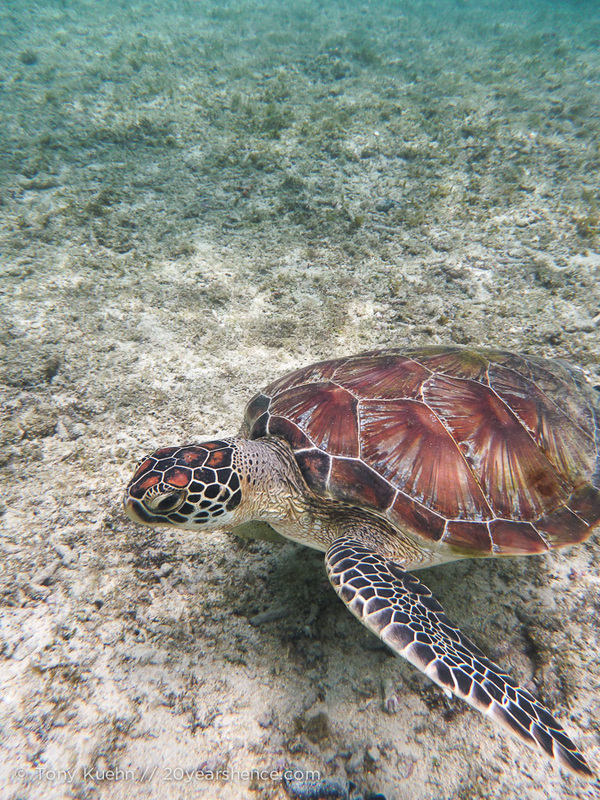 In fact, most of the turtles we saw on our outing were in water that was rarely more than 2 meters deep. Following our discovery dive, our dive master, MackMack, offered to give us a tour of the turtle sanctuary and help us spot some turtles. He warned us not to try to touch or ride the turtles, which we thought was funny simply because we doubted we’d ever get close enough for this to be an issue. However, the turtles seem to know that they are in a protected area (or perhaps have simply become inured to snorkelers), so were completely unfazed by our presence and simply kept on munching on their lunches; in many instances we came within inches of the turtles without them ever blinking either of their obsidian black eyes. But no, we did not ride the turtles. 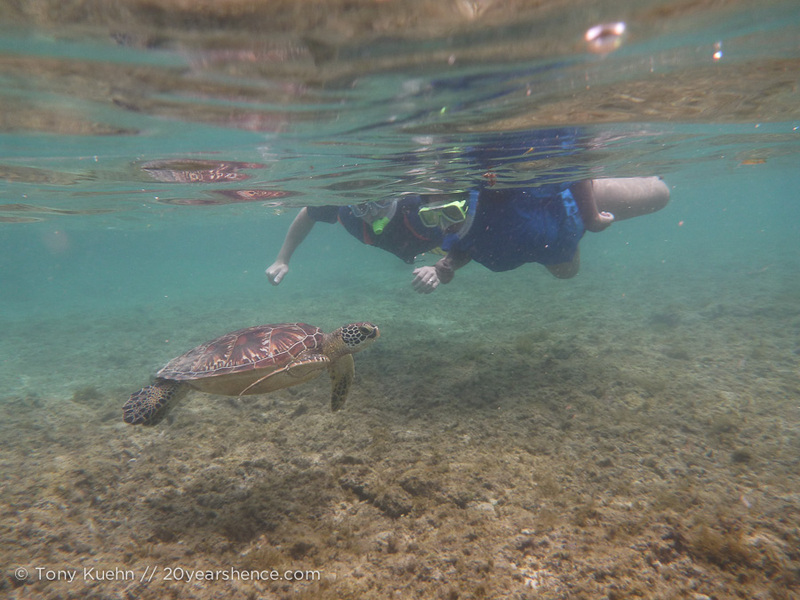 We only went snorkeling with the turtles once, but on that outing alone, we more than got our turtle fix: we spotted 15 turtles, both big and small! It was such a thrill to get so up close and personal with such graceful creatures, and despite our excitement, we even managed to snap some pretty excellent photos (if we do say so ourselves). Awwwwww! I love seeing turtles on a dive. They’re not as frequent here but I usually see about 1 or 2 a week! That said, I still love seeing turtles on dives! It’s just that they, along with clownfish and lionfish (I know you feel me on that one) have become such common sightings for us that we are after more obscure stuff now! Really, though, whatever wildlife we see on dives gets me happy. Awwww, so cute! I’ve always wanted to snorkel (I’m too scared to dive) with turtles but they’ve managed to evade me thus far… Where was this, by the way? I don’t think you mentioned it in your post. 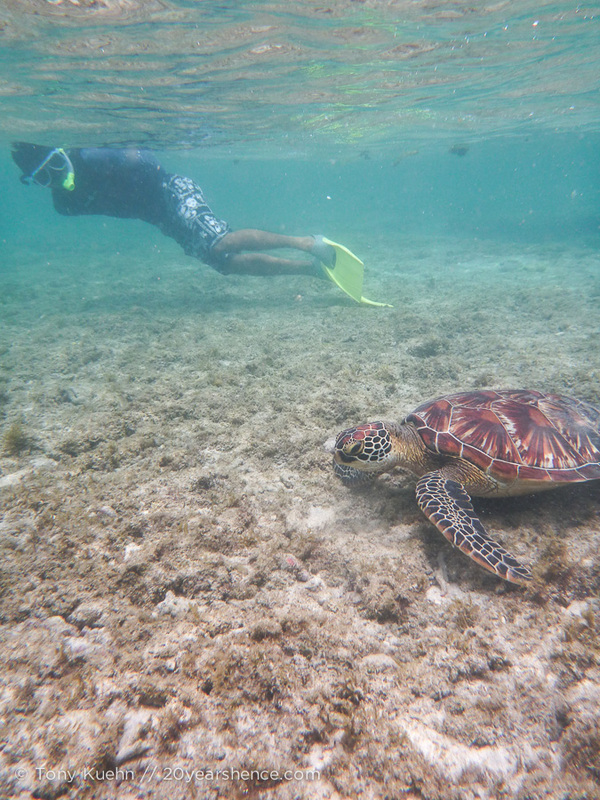 The great thing about snorkeling with the turtles is that it was so shallow that diving wouldn’t have gotten you anything anyway. Truth be told, while we are sure deep divign holds its allures, we have often been told that the shallower sites are often the most interesting as the deeper you go, the more color gets lost and that’s not where you see the greatest abundance of sea life. Great pictures, and a big +1 for the TMNT reference! Aww, they are so cute. What kind of camera are you using for your underwater photography? May I know where the location of this turtle sanctuary is? It is very pretty.